This is my character sheet, or design specification, for Mary Magdalene. The purpose of this sheet is to keep a record of the attributes or characteristics of my drawing, so that I can draw a similar-looking cartoon in all future scenes including Mary Magdalene. I first drew my version of Mary Magdalene in March 2009, very early on in the history of Bible Cartoons. By formalising my ideas on a character design sheet in this way I would have a simple and accessible design reference point, which would remind me of what I had drawn in previous cartoons. By referring to this sheet every time I drew a scene including Mary Magdalene I hoped I would be able to draw and colour her to match previous cartoons, ensuring great similarity and therefore continuity between Bible Cartoons featuring Mary Magdalene, even if these cartoons were drawn months or even years apart. 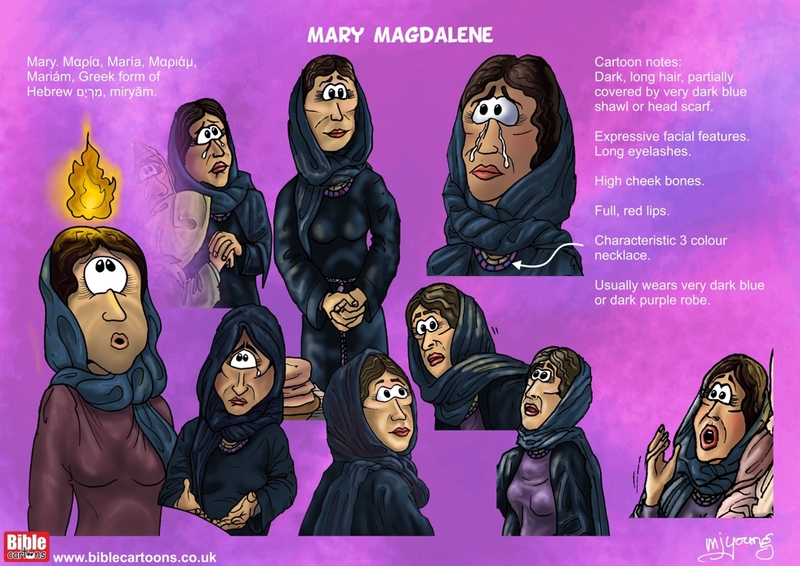 Without this character sheet to refer to I might very well accidentally draw a scene where the Mary Magdalene character is quite different from previous drawings, which would be a problem if someone views and/or buys several Bible Cartoons and the same person looks quite different in each scene! There is a very real danger of this happening since my abilities and style gradually change and evolve over time, especially as I learn new art techniques and want to incorporate new ideas into my Bible Cartons. By referring to the character sheet I can be confident that I will draw a similar-looking person, even if my artistic skills have undergone change and development over time. 01) Mary, the mother of Jesus. 02) Mary of Magdala (Mary Magdalene). 03) Mary, the mother of James and Joses, the “other” Mary. 04) Mary, the wife of Clopas. Mary. Μαρία, María, Μαριάμ, Mariám, Greek form of Hebrew ‏מִרְיָם‎, miryām meaning “obstinacy, rebellion”. María Magdalene´, ie of “Magdala”. The noun “Magdala,” from which the adjective “Magdalene” is formed, does not occur in the Gospels. The word in Matthew 15:39, is “Magadan”, a region on the western shore of the Sea of Galilee. Mary was a devoted follower of Jesus. She was the first person to see Jesus after His resurrection, and her testimony of that fact is highly significant. Along with some other women, Mary made her money available to Jesus, ministering to him “out of their private means” (see Luke 8:2-3) . No doubt this was in part due to Mary’s gratitude towards the Lord for her deliverance, since of Mary it is written that “seven demons [daimonia] had gone out” of her (see Luke 8:2; Mark 16:9) . These women accompanied Jesus on his last journey to Jerusalem (Matthew 27:55; Mark 15:41; Luke 23:55). Mary Magdalene was a close companion of Salome, the mother of James and John (Mark 15:40), and also with Mary the mother of Jesus (John 19:25). These women “were standing at a distance, seeing these things” (Luke 23:49), as Jesus died on the cross. Mary remained by the cross until Jesus’ death, and she saw his body being taken down and wrapped in a linen cloth and placed in the tomb by Joseph of Arimathea (Matthew 27:61; Mark 15:47; Luke 23:55). Mary Magdalene with Salome and Mary, the mother of James, “brought spices, that they might come and anoint” Jesus’ body (Mark 16:1). The next morning, before dawn, they came to the tomb (Matthew 28:1; Mark 16:2). Mary Magdalene had been to the tomb, had found it empty, and had seen the angels (Matthew 28:5; Mark 16:5). She went to inform Peter and John (Luke 24:10; John 20:1-2) and, returning with them, waited by the tomb, even after they went away. Looking into the tomb, she saw 2 angels, and she replied to their question as to her reason for weeping, “They have taken away my Lord, and I do not know where they have laid Him.” Turning around she saw what she took to be the gardener, which turned out to be the resurrected Jesus. “Rabboni” (Teacher) she exclaimed, and rushed forward to embrace His feet. Jesus’ response was “Stop clinging to Me, for I have not yet ascended to the Father” teaching her a spiritual dependence upon Christ that could live without His visible presence. Mary then went to the disciples and told them what she had witnessed (John 20:11-18), which is the last mention of her in the Bible.